Since March 2012 the Prince-Abbot of San Luigi has served as Royal Protector of the Regency of Lomar and as a member of its Sovereign Council. The position of Regent of Lomar, which carries with it the title of Duke of Saih Nasra in the Abbey-Principality, has been vacant following the death of the last Regent, Dom Klaus Schlapps OPR OA, in January 2013. The Regency of Lomar is fundamentally a small sovereign, non-territorial, non-profit, transnational diplomatic and humanitarian institution, or non-government organization (NGO). ROL primarily provides humanitarian and direct aid for refugees and other abused people, and works closely with international aid, government and non-government organizations in compliance with the UNHCR Convention of the Status of Refugees and the UN Universal Declaration of Human Rights. Although some have described the ROL as a micronation, it has always rejected this term. Founded in 1997 in Silicon Valley, California, by Lawrence A. Cleenewerk and a small group of Catholic and Orthodox Christians, Lomar was inspired by the novella The Dream-Quest of Unknown Kadath by H.P. Lovecraft, from which Cleenewerk developed the idea of a state which would provide an “utopian safe haven for refugees and displaced persons”. Initially titling the project the Republic of Lomar after the legendary polar kingdom of the same name, Cleenewerk later adopted an acronym to describe its aims, “Libre Organisation Mondiale d’Aide aux Réfugiés”. In March 1998, the Republic of Lomar Foundation (Fédération Humanitaire Republique de Lomar) was incorporated as a non-profit corporation in Delaware, USA. An office was initially established in Washington, D.C., moving to Nevada in 2004. A paper entitled “The Republic of Lomar, Sovereignty and International Law” discusses the status of Lomar at this time. Lomar grew quickly and developed a network of volunteer diplomats, with a particular base in France and consulates in seven countries in all. By 2001, there were over 4,500 registered citizens located all over the world. Lomar issued its own passports, similar to the UN Passport or the Nansen Passport, to the collective community of underprivileged people, including exiles, stateless refugees, victims of oppressive regimes, unrepresented people (Lomar has been a supporter of the UNPO (Unrepresented Nations & Peoples Organization) from the outset) and other deserving individuals who were in need of relocation. Legal help was offered with immigration matters. Although no state formally recognized Lomar, its passports were used to enter countries including Russia and Cuba. The Lomar flag symbolically represents the green color of Life on Earth and the blue symbol of the sky and life-giving Water. The purple star is the symbol of Hope and Royalty, representing the Polaris Star. The flag was manufactured both in full size and in miniature versions suitable for desktop use. In 2001 a group of criminals in Nigeria – a country where Lomar has never had any representation – used the Lomar name without authorization to sell bogus passports and “citizenships”, with tens of thousands of people suffering financial loss as a result. Lomar worked with international police authorities to combat this menace and expose it in the media, but the ensuing scandal was at a heavy cost to its resources and reputation. In December 2003, Dom Klaus Schlapps was appointed First Counsellor and President of Lomar. He changed the name from Republic to Regency of Lomar and was elected the first Regent in 2004. Finding Lomar’s fortunes at a low ebb, he worked with others, particularly Secretary General HE Renaud Le Mailloux, to revive its humanitarian activities, now no longer concentrating on stateless persons as had previously been the case, and free from all religious or political affiliation. Before long, Lomar had started to develop new and productive endeavours. Through Dom Klaus’s project Art Aid a hospital was built in Peru and a daycare centre was also scheduled for construction. A programme of wind turbines in Burkina Faso generated electricity for villages there, and a consignment of ten computers, bicycles and other goods was sent in late 2005. Work in collaboration with the Navti Foundation in Cameroon led to the donation of five tons of humanitarian aid in May 2005, including old computers for the use of children there, sewing machines (with volunteer teachers from ROL to teach their use), bedding and free medicines supplied as a result of Dom Klaus’s association with German-based charity PARMED, where he served as president. Donations were made to the victims of Hurricanes Katrina and Rita. In the People’s Republic of China and Hong Kong SAR, ROL supported the care of the elderly and young children. A Mercedes jeep was donated by PARMED to help ROL work in Cameroon. Literary and music competitions were organized, and a fundraising CD “Sounds of the East” was issued. The patrons of the ROL included French politician Jack Lang; the Fon of Nso, HRH Fon Sehm Mbinglo I, the Fon of Mbiame, HRH Schindzev Tata II, and the Fon of Nseh, Kwinkor Fonban, from Cameroon; Princess Angela Fugger von Glott; and HIH Prince Nguyen Phuc Buu Phuc of Viet Nam. Dom Klaus received the title of Shufaiy Ngaibunri (equivalent to Duke) from the Fon of Nso in recognition of his humanitarian work. The associations entered into by the ROL included Akamai University, Hawai’i, USA, PARMED e v., Leinau, Germany (now defunct, archive site), the Navti Foundation, CRIG International, the Association for Protection of the Rights of the Refugees from Abkhazia (APPRA), Georgia, ANAMED, and the International Green Cross Organization. 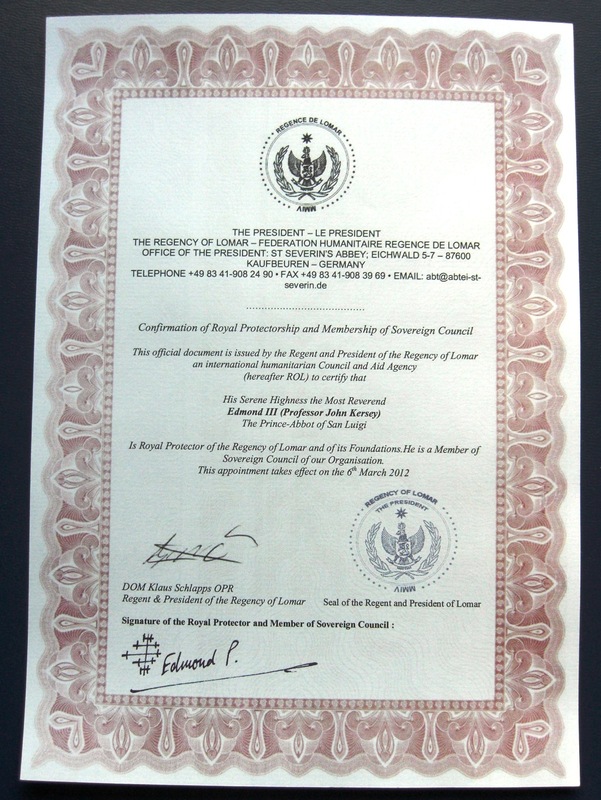 In February 2012, mutual recognition was extended between the ROL and the Abbey-Principality of San Luigi. 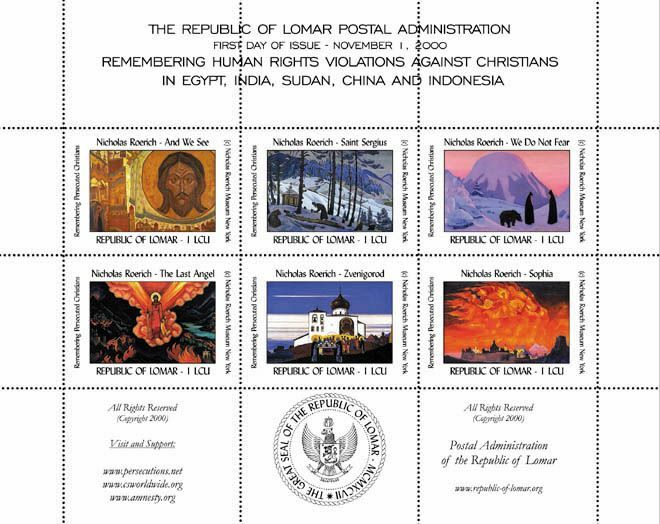 Before 2004 a number of Lomar stamps were issued. Two of these issues are shown below. Proceeds from the sale of the stamps in remembrance of the occupation of Tibet went to the Tibetan government-in-exile. In 2006 the only coin of Lomar was issued, a 1 Kurant piece in bronze that depicted the arms of Lomar, the Arctic Wolf and the Polaris Star. All of this meant that Lomar stood – and stands still – as one of the most successful virtual government projects in the history of the internet. In 2009, however, a major software and database failure placed its future in jeopardy. With no backups available, activities were suspended and serious consideration was given as to whether Lomar should continue. In 2012, Lomar returned with a limited internet presence and support was sought from outside agencies and individuals for it to resume its work. The sudden and unexpected death of its Regent in the following year again called a halt to its activities, and so Lomar now waits to discover the next chapter in its existence.